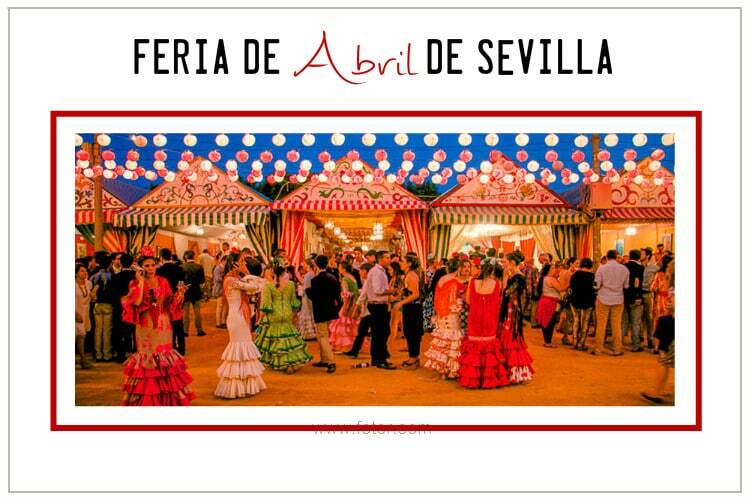 Feria de Abril de Sevilla – Spring has sprung! Spring is a special time of year. The days are longer, trees begin to grow green, flowers are blooming and the temperature is rising! What could be any more Spanish than celebrating the arrival of la primavera with a big cultural festival? 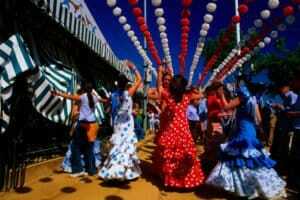 Held two weeks after Semana Santa, the Feria de abril de Sevilla is a very important date in the Andalusian calendar! The festival lasts for one full week, starting on a Monday and continuing all the way through till Sunday. The celebrations consist of boisterous dancing, singing, drinking, feasting, processions, and merry making! You can find the main attractions at the famous Los Remedios along the Guadalquivir river in the city centre! Along the ancient streets of Sevilla you will find all kinds of traditional Andalusian food, drinks and even performances of flamenco and salsa! As most of these festivals do, the Feria de Sevilla started as a regular trade fair for the local farmers and landowners to exchange livestock for the coming season. Officially decreed by Isabell II, it began in 1847 and was held in the beautiful Prado de San Sebastian. Over time, the fair turned into a popular event for the city, attracting people from all over the country and eventually becoming quite the social occasion. Since then the fair has grown and grown to the point where there are over 1,000 vendors and organizers hosting over 1 million people over the whole week! You probably don’t have time to spend the entire week in Sevilla, and thats why Citylife is heading down to Sevilla to check out this amazing festival over the weekend! From April 21st-22nd we will soak in some Andalusian sun, enjoy some great food and experience fabulous culture! If you are interested in spending the entire week celebrating with the Sevillanos, check out the official events calendar!